No other examples of this type of fan – that is to say a folding fan with sticks joined at the pivot end with a cord or ribbon – are thought to have survived. Fans such as this were fashionable for a relatively short period only, worn often in conjunction with wheel farthingale dresses – as popularised at the Court of Queen Elizabeth I. 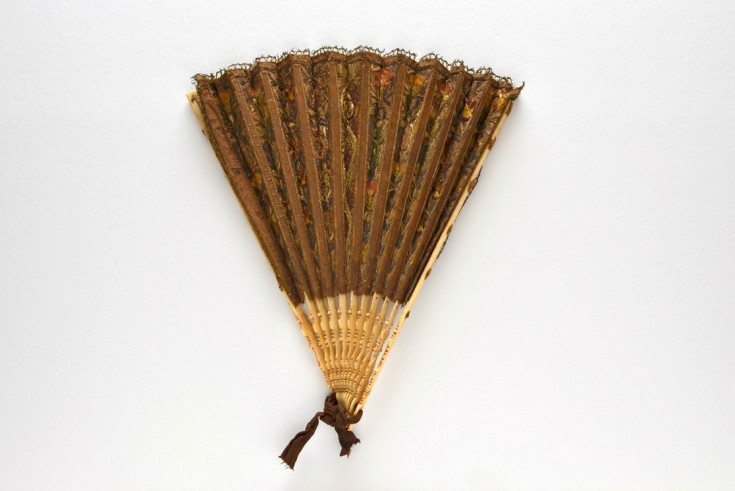 The fan is a remarkable survival and dates from a time when folding fans had only recently been introduced to Europe via trade with the East, thus replacing the fixed fan as the noblewoman’s essential costume accessory/status symbol. The fan has shaped sticks crafted from ivory. The outer guardsticks, set with tufts of silk, are pierced with minute holes through which fine threads connect monture to mount on either side. The silk mount is double and richly embroidered with polychrome and metallic threads in a style typical of the Elizabethan period. 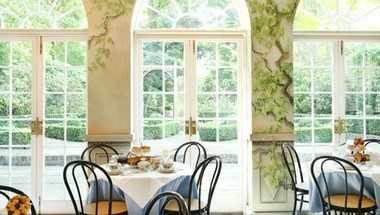 A charming panelled design of scrolling vines with assorted flowers, fruit (and snail) is repeated on both sides. In England the craft of fan making did not begin to take form until the latter stages of the seventeenth century. 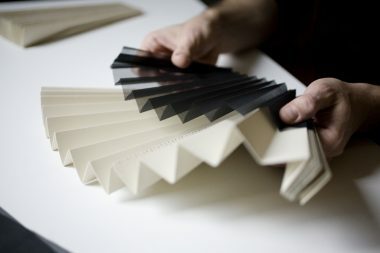 It is quite possible the ivory fan sticks were shipped from the Far East to the Continent (where fan making was already established) whereupon the fan was assembled before arriving in England to be hand embroidered. The fan was secured for £45,000 with both NHMF and the Art Fund contributing £12,500 each, plus a further £1,500 from the Art Fund towards a display case for the fan. Other donors included the Friends of The Fan Museum. In early September 2015, the fan will go on long-term display within the museum’s permanent gallery. A mixed programme of events is planned to celebrate the acquisition and includes the premier of a new play based on the lives of Elizabethan literary heroes, Shakespeare & Marlowe (July 22 and 23 2015).